This part 3 in my series on how to be more creative in your public speaking. The simple lesson – choose new. Every minute of the day there are 48 hours of new content put on YouTube alone! You need to set up 48 screens in your house and watch them continuously and simultaneously in order to keep up. But that’s not the point. The point is there is ALWAYS something new. A new video, a new picture, a new product, a new strategy. This is not different. This is new. Incorporate something new into your presentation whenever you can and you will find your creative juices flowing. 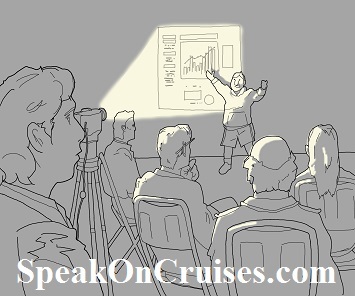 Like many public speakers, not just on cruise ships, but in any presentation, become comfortable with PowerPoint. Me, too. I keep learning many things that PPT can do that are ‘new’ to me. I am also learning and trying other presentation tools – Powtoons, LivePrezo and Prezi. Additionally, I am always on the lookout for a different, new to me video or image that I can apply to get my message across. Keeping my eyes and mindset open = being creative. If I stay with it I can keep my presentations fresh and appealing and that is why we want to be creative, isn’t it?